Christmas has come and gone (Bali was great as usual!) and we are well past any new year resolution ideas....or are we? Life has been so busy lately since our holiday in Bali, with a trip to Cardiff and an IB ITGS curriculum design meeting, a full weekend workshop, Create the Future, co-run by Kim Cofino last weekend, followed by Technology Week at BISS, that I have not blogged properly for weeks! So, starting this week I want to start some serious sharing and ideas-based blog posts in addition to this new idea I have of sharing one picture each week taken from my study window. This morning is crisp, cold and sunny. 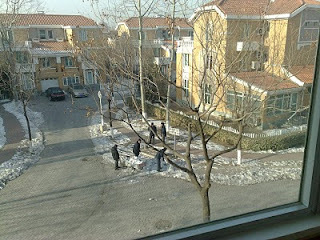 Workers on our 'compound' called 'Capital Paradise' here in Shunyi, Beijing, are continuing to clear the snow that was dumped on Beijing 3 weeks ago. Nice idea to do a series of photos showing the seasons. How did the Technology Week go at BISS?What an incredible outline and opportunities. The outside of your house is looking beautiful.This year the cold was on the rise.